Dozens of supporters celebrated with Paul Murphy and others, assured that their right to protest has been protected. DOZENS OF PASSING cars beeped their horns. A large crowd chanted in unison, waving signs proudly on a grey, wet day beside Dublin’s Phoenix Park. Alongside the crowd, a media scrum waited on the steps of the Criminal Courts of Justice. After nine weeks of evidence, a jury took just over three hours to find Solidarity-PBP TD Paul Murphy and five others not guilty of falsely imprisoning former Tánaiste Joan Burton and her advisor in their car on 15 November 2014. The trial lasted two months but the result felt like it was years in the making for the defendants. For supporters of Murphy and the other men involved, it dates back to the beginning of the movement against water charges in Ireland years before – a movement that has seen Irish Water bills all but eliminated from the country. 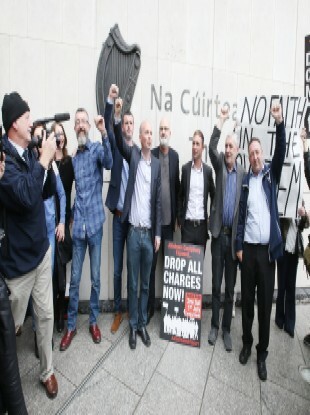 As a jubilant Paul Murphy, Councillor Mick Murphy, Councillor Kieran Mahon, Frank Donaghy, Scott Masterson and Michael Banks exited the court to rapturous applause, the overwhelming sentiment from these men and their supporters was that the establishment had tried to take on – and silence – a working class protest, and failed. Even in a climate of people protesting forcefully against austerity and water charges, the events of 15 November 2014 particularly garnered a lot of attention. As TheJournal.ie‘s report at the time outlined, the then-Social Protection Minister Joan Burton, and her advisor Karen O’Connell, were confined in a car for several hours. Anti-water charge protesters focussed their attention on the Labour leader at around 1pm as she attempted to leave a graduation ceremony at An Cosán — a higher education college in Jobstown. During the trial, the prosecution argued that the men were “plainly involved in the restriction of liberty” of the two women who were trapped in garda cars for three hours after they left the event. The trial heard that when Burton attended the church ceremony that day, eggs and water balloons were thrown at her. She was advised by gardaí to leave in an unmarked garda car in order to avoid the crowd. However, their car was immediately surrounded by protesters, including the accused men, and they were unable to leave the church yard. At one point gardaí moved in and unsuccessfully tried to remove the accused men, pulling off Paul Murphy’s top in the process. Burton and O’Connell remained in that car for about an hour before a decision was made to move them to a garda jeep. The trial was told that a police cordon set up to protect the women as they made their way to the jeep was immediately broken up by protesters, many of whom were screaming abuse. The jeep was also then surrounded and moved “inch by inch” along Fortunestown Road over the next two hours before the women ran to waiting garda cars and left the area. The prosecution submitted that by surrounding the cars containing Burton and O’Connell, the six men worked together with a “shared intention” to totally restrict their liberty. “Joan Burton and Karen O’Connell were trapped,” Sean Gillane SC, prosecuting, told the jury in his closing address last week. Their liberty was not just restrained, it was totally restrained. Their liberty was never in truth restored until they were running down that road coming up to 4 o’clock that afternoon. Defence counsel argued that it was this “fear of violence” that led to the women being kept in the vehicle by gardaí, not the peaceful acts carried out by the accused men. Some defence counsel were highly critical of gardaí, who they said were unprepared for the protest and made unwise tactical decisions. They submitted there was “something rotten at the core of this investigation” because evidence given by gardaí was proved “demonstrably wrong” in court by video footage. Judge Melanie Greally echoed that sentiment in her final instructions to the jury earlier this week, when she told its members that they must weigh up the evidence given by gardaí as being inconsistent with the video footage, and make their own judgement on why that would be the case. Judge Greally also stressed upon the jury that “this case is not about the right to protest”, and added “your verdict is not about sending messages”. Despite the judge’s comments, however, supporters of the Jobstown protesters were unequivocal that the right to protest was what this case was primarily about and that the not guilty verdicts sends an incredibly strong message to the political establishment. Although traditionally seen as a party of the working class, there was clear disdain for Labour among the supporters of the protestors who viewed the party as firmly entrenched within the establishment. This was evidenced in court this week with the jeering and mild heckling of Judge Greally as she reiterated the evidence given to the court by Joan Burton. In a statement following the verdict, the Labour Party said: “We note the verdict of the jury announced earlier today. “The investigation of any criminal matter, and the conduct of any associated prosecution, is decided by An Garda Síochána and the law officers of the state who operate with complete independence from the political system. As we have been all along, the Labour Party remains resolutely focussed on our central tasks of holding the Government to account, and campaigning for decency, justice and equality in society. Before the verdict was reached, TheJournal.ie spoke to some supporters of the accused men, some of whom were actually at the protest on the day. Their take was that bringing criminal charges against Paul Murphy, in particular, was an overt political act. One man said: “It is essential that they are found not guilty. Otherwise, the parameters for everything changes – for any form of protest, right down to strikes. Everyone would have been affected by a guilty verdict here. When asked why she was there supporting the protesters, one woman said: “Well there’s a lot of people here that were there on the day. I was there on the day. A lot of people are looking at the accused. They think this is a farce. I think this is to get Paul Murphy out of the Dáil. They feel threatened. They’re saying it’s not political – it is political. After the verdicts were reached, TDs and politicians doubled down on this stance outside the court. Solidarity-PBP TD Mick Barry got the news just before Leaders’ Questions started in the Dáil. He told TheJournal.ie that he had the great pleasure of informing Tánaiste Frances Fitzgerald and Labour leader Brendan Howlin of the verdict. “I legged it out of there, and I came down to celebrate,” he said. “This is great for the six men, but this is great for the working class. The jury has defended the right to protest. I’m choking back tears to be honest. Outside the court, Paul Murphy was quick to praise his legal team, but also looked to the support the accused had received from their #JobstownNotGuilty campaigns that had become ubiquitous on social media. He said that their efforts “inside and outside the courtroom” had contributed heavily to yesterday’s result. As Barry and Murphy embraced, with the chants of “Jobstown, innocent” ringing in the air, there was the sense that this was a major political victory. Party colleague Brid Smith told TheJournal.ie: “It’s a great result for the Left, the water movement and, in particular, it’s a great result for the people of Jobstown and their representatives. It sounds out a strong message that the people have risen and will not be put back in their box… So Leo Varadkar’s attempts to shut down the Left in the Dáil will not be tolerated. And, with that, the chanting slowly began to die down and signs were folded and put back away. “To the pub,” one of the accused shouted, as the water charge protesters went home to celebrate as victorious, free men. Email “'People have risen and won't be put back in their box': Jobstown supporters hail a political victory”. Feedback on “'People have risen and won't be put back in their box': Jobstown supporters hail a political victory”.